Copyrights protect the expression of ideas, and prevent the unfair use of an author or publisher’s original work, including literary works (books, newspapers, magazines, journals), artistic works (photographs, paintings, sculptures, diagrams), musical works, sound recordings, films and broadcasts. Copyright is one of several existing rights of intellectual property (IP), including trademarks, patents and designs, among others. Copyrights belong to the author of a work of literature or art, and consist of economic and moral rights. Economic rights allow the author to authorise/prevent the reproduction of their work. They can be licensed or transferred. Every use of the economic rights of an author requires payment unless otherwise decided by the author. While an author or artist spends many days of his/her life to publish their work of art (in any form) and present it to the public, people prefer buying the cheaper and unauthorised version of their creation to save some bucks. In doing that, we forget to realise that we ourselves become infringers, and could be sued or sent to jail for the same. Reduce the cost and risk of copyright infringement. Provide convenience and certainty with one annual fee for a single transaction. Distribute photocopies in your organization’s secure network. Scan and make digital copies of material. Make digital copies available in your organization’s secure network. Take reference book topics and distribute them. The simplest way to go about it and save yourself from a lawsuit is to get licenced. Thankfully, getting one from IRRO is a matter of few clicks. Gone are the days where you had to stand in queues to get a copyright license. Now, you can just sit in the luxury of your home, download the licensing form, fill it up and send it to info@irro.org.in. 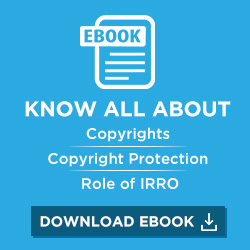 An IRRO license works to the advantage of both content creators and users. For both parties, going legal is a win-win situation. So, keep your creativity alive and reproduce original works with proper authorisation. Click here to download the form and get licensed now.